Since our very beginnings in 1884, Daniel has helped children who were orphaned or abandoned receive the care they so desperately needed and deserved. More than a century later, we not only directly connect foster children with loving, permanent families, but also serve as a resource to the entire state for a wide variety of adoption questions and issues. Daniel works with the Florida Department of Children and Families to oversee the Florida Adoption Information Center — the state’s single source for all information about adoption. Simply put, if the word “adoption” is in the sentence, we can help. Whether you are a family seeking to adopt in Florida, an adult adoptee seeking to reunite with your birth relatives, or a pregnant woman considering adoption for your baby, the Florida Adoption Information Center can provide the information, resources, and guidance to answer your questions. Serving more than 230,000 people since opening in 1994, we stand ready to help you with any of your adoption information needs. 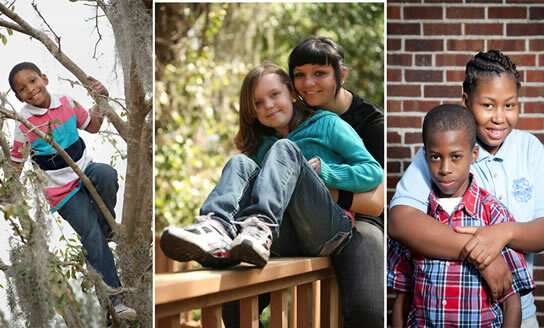 Contact: For answers to your questions about adoption in Florida, visit www.adoptflorida.org or contact our team at the Florida’s Adoption Center at 1-800-96-ADOPT (1-800-962-3678), or locally at 904-353-0679. You can also send an email to adoptflorida@danielkids.org. Daniel also finds adoptive families for the select Specialized and Traditional Foster Care children who can never return home safely. Even as these kids are receiving immediate nurturing and care from temporary foster families, Daniel is searching for a secure permanent home where they will be cherished and have their own opportunity to flourish. On any given day there are approximately 50 eligible children in Daniel foster care waiting to be adopted into new families. If you’ve ever considered adoption, please consider the many benefits of adopting a child from foster care. Foster care adoption is free, legally secure, and offers free child medical care, financial assistance, federal adoption tax credit, college tuition assistance, and ongoing guidance and support. Contact: For more information on the benefits of adopting a child in Florida, the types of children awaiting adoption, and adoption assistance available, visit www.adoptflorida.org or contact our team at the Florida’s Adoption Center at 1-800-96-ADOPT (1-800-962-3678), or locally at 904-353-0679. You can also send an email to adoptflorida@danielkids.org.